The kids are sure to be impressed with this all-American meatloaf, particularly as cowboy beans are involved. Turkey, pork or lamb mince would work just as well instead of beef mince. Use gluten-free breadcrumbs if necessary. Preheat the oven to 240°C/gas mark 8. Lightly grease a large, wide baking dish or roasting tray and set aside. To make the meatloaf, place the mince, onion, mustard, spices and some salt and pepper in a food processor and blitz until well combined. Add the egg and breadcrumbs and blitz again briefly. Tip out into the prepared casserole dish and shape into a large rugby ball shape about 20cm long. Be sure to shape and press the loaf well to help it stay together. This can be prepared to this stage up to a day in advance and kept covered in the fridge. When ready to cook, rub the meatloaf all over with the oil. Pop in the oven, then immediately reduce the temperature to 200°C/gas mark 6 and roast for 30 minutes until catching colour and firm to the touch. Meanwhile, to make the cowboy beans, pour the tinned tomatoes into a sauté pan and add the hoisin sauce, garlic, vinegar and paprika. Bring to the boil over a medium heat, then reduce to a simmer for 10 to 15 minutes, until thickened, stirring occasionally. Remove from the heat, stir through the beans and season to taste. Once the meatloaf has had its time, remove it from the oven. Pour the cowboy beans all around it in the dish or roasting tray. Lay the bacon or pancetta slices over the top of the meat and sauce in a single layer. Pull the leaves from the thyme stalks and scatter them over. Return to the oven for 15 minutes, until the bacon or pancetta is crisp and golden and the cowboy beans are bubbling. 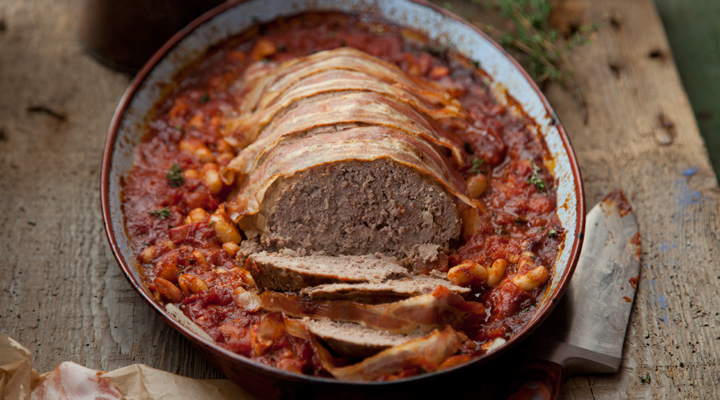 Cut the meatloaf into slices and arrange on plates with the beans and bacon or pancetta. Serve at once with crusty bread to mop up the sauce.